Purchase a single pass and receive VIP treatment and skip-the-line benefits at many Vegas nightclubs, dayclubs, pool clubs, gentlemen’s clubs, bars and lounges. Locations include Tao, Marquee, Chateau, Hyde, Palms Pool, Azure, Sapphire Pool, voodoo Lounge, Rockhouse, High Roller, Senor Frogs, Hustler, Sake Rok, and many more. Certain venues may have restrictions on dress code, entry times and more. 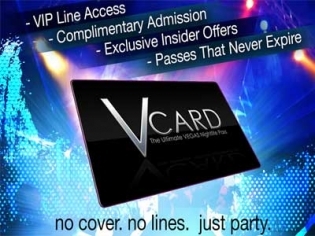 Make sure to check specific requirements on each of your passes when you pick up your V Card. Your V Card is good for entry into many locations which rotate frequently. Check website for exact locations currently available. Easy to use, simply go to a participating venue, get in the VIP line, show your ID and V card and you are in!